Haddon rocking horses was the name given to the company started by John and Mary Labouchere in Oxfordshire England. 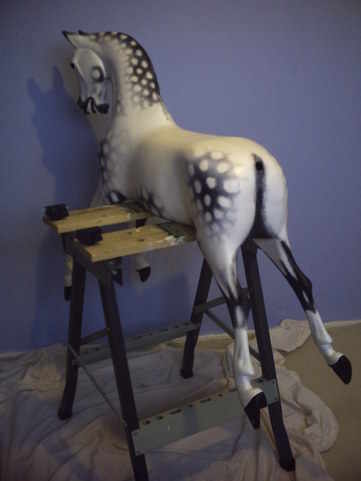 The rocking horses bodies were constructed from fiberglass rather than wood, as they were made with the intention of being durable & long lasting. The moulds that Haddon used to craft their horses from were moulded from original Victorian F H Ayres & G & J Lines rocking horses. This can be seen in the Haddon rocking horses shape & style as it is today. The swingstands were crafted from wood. The earlier Haddon rocking horses are often found with the plaques still intact to the stand which have the place name of manufacture on, either "Didcott' or 'Wallingford' ( The eventer model on bow rockers was manufactured by Haddon circa 1970's ) one of their earliest made. The thumbnail photos below show a variety of different styles / types of Haddon rockinghorse. Some are in the original Haddon condition and others are shown in their refurbished or restored condition. Please note, the rocking horses on this page are not available for sale. The photos are for your interest only. The below thumbnails show a Haddon rocking horse on a bow rocker. 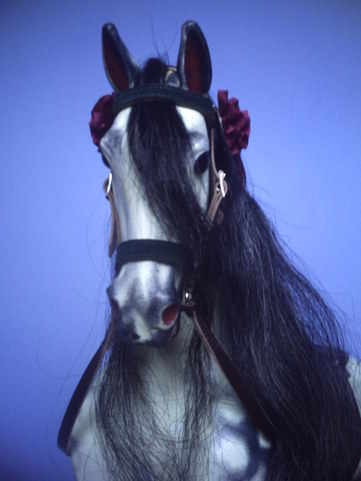 The rockinghorse itself was moulded from a G J Lines Victorian bow horse & the bows from laminated wood. 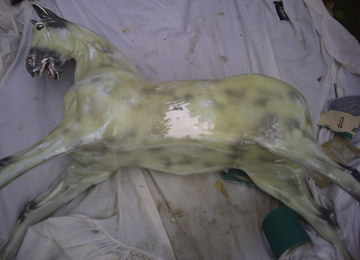 The first photo shows the horse having started it's restoration & in the white. The following photos show him with his progressive coats of paint, dapples applied and lastly antiquing to give him an old aged antique finish. Circa 1970's One of the earlier Haddons. The below photos show a Haddon rocking horse that was restored by APES rocking horse makers & restorers Pam and Stuart MacPherson. 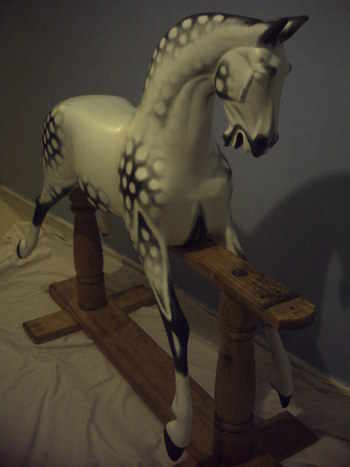 This particular horse has been moulded from an original F H Ayres (Frederick Henry Ayres) wood rocking horse. Painted as a chestnut based on a real horse & dressed with top quality leather saddlery made by a master saddler. 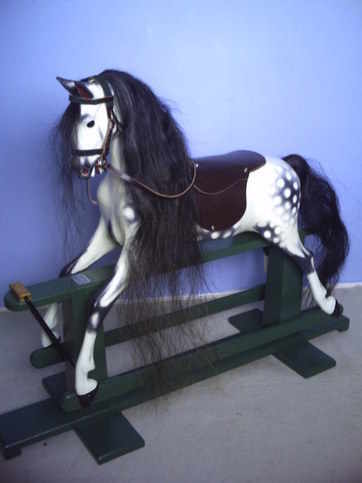 The thumbnails below show a rocking horse very similar to that of Haddon but the plaque on the swingstand of this one was labelled ' Bowkett rockers' It has been moulded from the same kind of F H Ayres rocking horse as Haddon used in their moulds. 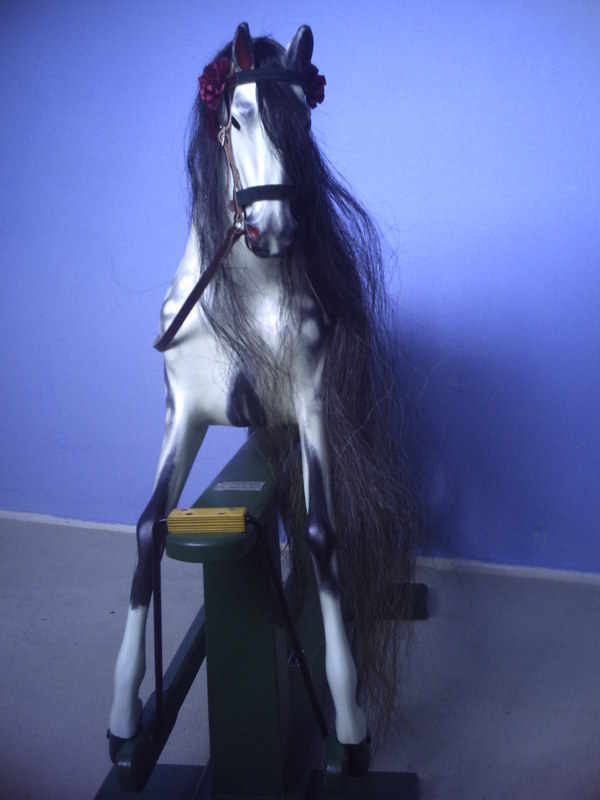 There were quite a few other rocking horse makers who made their own moulds other than the Haddon manufacture. The below rocking horse has been refurbished in a realistic dapplegrey style with removable leather master crafted saddlery. The stand itself has different style turned posts than that of Haddon. 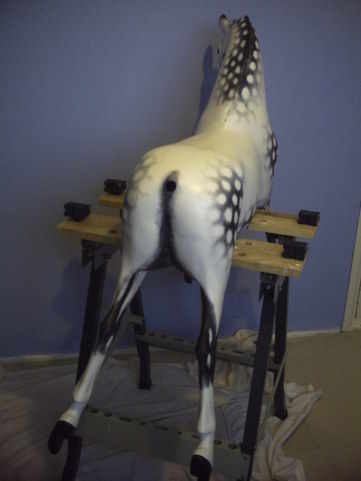 The below photos show a rocking horse that came in for restoration from a school. They wanted it to be restored with traditional style dapples rather than the usual Haddon spray paint restore. The first photo shows it in its original condition before restoration. The following photos show it's progress to the finished result with a black horsehair mane & tail and fixed saddlery for safety. The below photos show Haddon rocking horses in their original condition, their casts moulded from the F H Ayres & G J Lines model Victorian wood rocking horse. The first 3 photos show them with their original sprayed on Haddon paintwork. 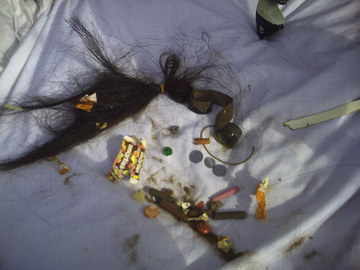 The first photo shows a present day Haddon rocking horse which is in very good condition albeit the pink rosettes that are not original and have been added at a later date. Haddon rocking horses have proved their durability through time and although some of the oldest models may have developed cracks from their continued use over the years, Haddon rocking horses are generally very strong & suitable for children to ride & play. They do not have the same issues with wood movement that wooden crafted modern & antique rocking horses suffer in reaction to climate environmental change as is the nature of wood. Haddons now advertise their rocking horses with a lifetime Guarantee!